Along with iSuppli Analysts, and other firms predicting the future of Windows Phone, IDC once again states this year that the Windows Phone will outsell the iPhone by 2016. 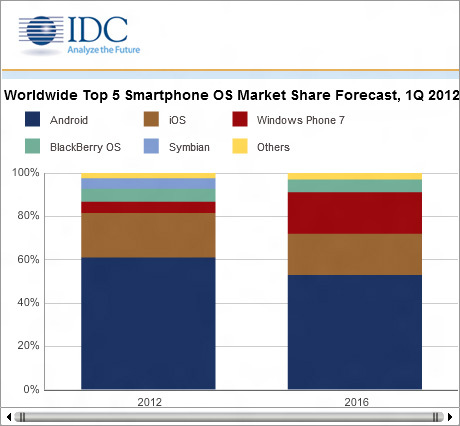 According to predictions by IDC, Windows Phone will be the operating system to experience the most growth over the next four years. The Windows Phone is predicted to achieve close to 20 percent market share by the end of 2016, second to Android with a predicted 52.9 percent, and ahead of iPhone with 19 percent. IDC analysts do clarify that the Windows Phone market growth will only continue with the help of Nokia, and all predictions assume Nokia continues to have the same success it is already having with Windows Phone.